You will quickly get addicted to a green smoothie lifestyle once you start feeling the benefits. These benefits (although these statements have not been reviewed and/or approved by the FDA) can potentially be "greater energy levels, improved immune system response, and much more. Some of the correspondents, as you can imagine, have informed us of improvements with diabetes medication intake (less and less requirements). Others have indicated liver-cleansing effects. Disclaimer: Consult your physician or health expert including your nutritionist, insurance agent, banker, lawyer, your spouse, parents, and your secretary...LOL, if you know what we mean! In order to increase chances for better nutrient levels, a high performance blender with a 3 horsepower blender motor is recommended. The power is in the power. The smoothie texture is going to be much finer with a high performance blender. Blended in the OMNI 3 HP blender for 60 seconds to 2 minutes, depending on smoothie texture preference. Other blenders can also be used to make this smoothie. But note, if our blender is not a high performance blender, aka 3 horsepower blender, you will not necessarily be able to taste the same flavors. This is because the finer cellular - level nutrients are not going to be released into your smoothie content with a Kitchenaid blender, or a Ninja blender, for example. 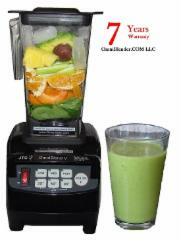 The Omni blender is a good 3 hp smoothie blender. Micronize your smoothie for 60 seconds or less. In the case of this smoothie, it took about 30 seconds to finish blending.